Since the 4th of July is right around the corner, I wanted to try something patriotic for this week’s hit or miss segment. While I was searching high and low, the July edition of Southern Living arrived. I really should get something out of promoting that mag, don’t you think? At the very end of the magazine (page 124) I hit pay dirt! 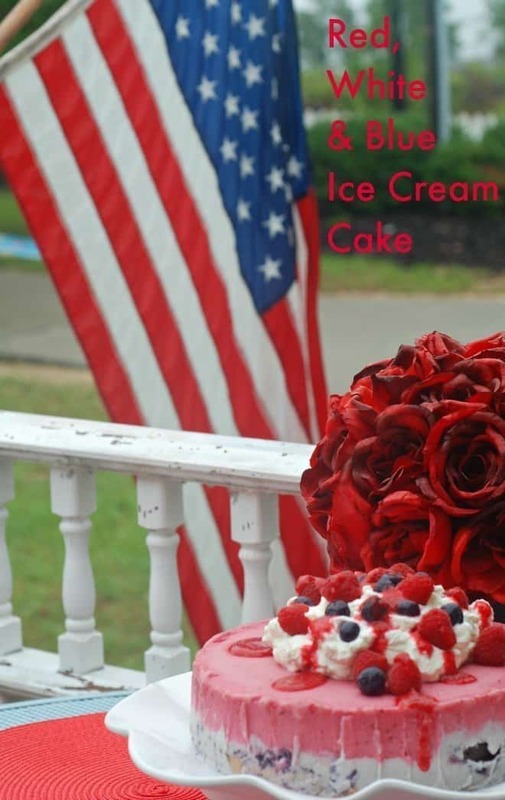 I found the perfect Hit or Miss – Red, White & Blue Ice Cream Cake. This dessert is beautiful and does take time. But it’s very easy to put together – there’s absolutely no cooking involved! Everything except the homemade whipped cream (easy peasy) and the raspberry sauce can be made a day (or two) ahead of time. The dessert consists of a layer of Sara Lee pound cake, a layer of blueberry ice cream (vanilla ice cream and blueberry preserves) and a layer of raspberry sorbet with raspberry preserves mixed in. I couldn’t find raspberry sorbet so I substituted raspberry sherbet. It just so happened that my daughter (#2) and son-in-law was at my house during the photo session. If you are a blogger, you understand the phrase, “photo session.” As soon as it was over, the taste testing began. Note: I believe raspberries are another one of those foods that you either love or hate. They are not my favorite berries, but hate is a very strong word. My daughter strongly dislikes raspberries and my son-in-law likes them OK.
Was the red, white and blue ice cream cake a hit or miss? We all thought the raspberry sauce was a little bitter (honey is the sweetener used in the sauce). I added a little powdered sugar and it was better. Daughter #2 did not like the raspberry ice cream layer at all, so she just ate the blueberry layer and the pound cake layer. My son-in-law (a picky eater, just like his wife) actually really liked it. And I ate a small piece and loved it! So, it was a big hit with my son-in-law and me! It was a semi-hit with daughter #2. Tonight I’ll serve it to daughter #3 and husband #1. Then I’ll add their opinion. Added later: Daughter #3 said this dessert was one of the best she’s ever had. She kept saying, “Awesome,” so I assume she liked it. The hubs loved it, too. It’s a winner! Helpful Hint: I wouldn’t serve this outside, because you’ll have a hot mess once it starts melting. It’s definitely a dessert to serve in the comfort of air conditioning. Oops, I forgot to address the pink elephant in the room! Did you notice that the raspberry layer is more pink than red? I’m thinking it’s because I couldn’t find the raspberry sorbet and had to use sherbet. I even added a few drops of red food coloring. Nope, still a little pink. But the red raspberries and the blueberries make up for the slightly pink layer. You can find the recipe by clicking here! Even if everyone doesn’t enjoy the raspberries, we must all agree that this dessert if overwhelmingly beautiful! It doesn’t matter about the pinkish color! I didn’t even notice until you pointed it out. This passes great for a Patriotic addition to the menu! Hi Alli! I think this looks gorgeous and I know I would love it because I happen to love raspberries! Maybe the next time you could try the red layer with strawberry if everyone in your family might like that better? I’m laughing at the “photo session” because do I ever understand that – people hovering by, spoons and forks in hand, practically breathing down your neck to hurry…that’s the photo session description around here. 🙂 Thanks for sharing this lovely dessert and have a wonderful day! I thought about strawberries . . . after I made the thing. 🙂 Hindsight and all that . . . This looks refreshing and I would like to give it a try. My kids have simple taste when it comes to ice cream, but I love adventurous flavors. Gorgeouse & festive! Happy 4th & this is a great treat for the World Cup this Thursday. Go Team USA! It looks amazing . . . . would love to try it out! Can we talk about how good that cake looks and how amazing your pictures are? That looks SO awesome for the 4th. I need to get my menu in order! Big Hit! I would love to have a slice of that cake now, it looks so good!!!! Gorgeous looking cake! I’ll be making that one for sure this 4th of July! I’ve got a couple of parties to attend to so this would be perfect and super easy! PS How is it almost the 4th of July already?!?!? Ha!! Wow! What a beautiful cake. I’m amazed you got any pictures before it was a puddle! (It always takes me forever to get pictures taken.) Really nice job. Pinning! Beautiful for sure! And a no backing cake in July is a big plus too! 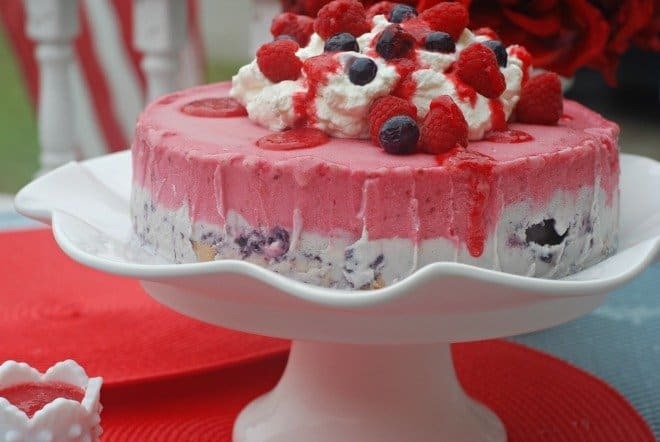 I think I would love it – I really like raspberries – especially in dessert, but probably not the blueberries 🙂 It looks pretty though – love the color! Stop. OMG! This looks like something straight out of a magazine! It’s absolutely beautiful! Oh, Alli! That’s so pretty! And here in Florida in July, the COLDER the food the better! Kristen from The Road to Domestication recently posted…Planning for the 4th of July! That’s how I feel, too, Kristen, the colder, the better! I’m with you, son-in-law, daughter # 3 & husband LOL. I’m pretty sure I would love this cake and your pictures look mouthwatering! 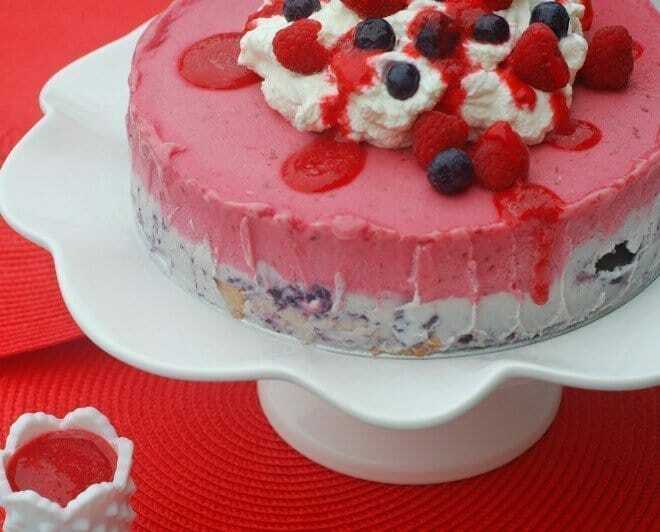 We love ice cream cakes and any refreshing fruity no-bake cakes during the summer <3 . Roxy | Roxy’s Kitchen recently posted…Wordless Wednesdays – Planning Our Activities For Canada Day! Total hit!!! Looks amazing Alli 🙂 Thank you for sharing! In this Florida heat, anything I can make without using the oven is A ok with me! Plain vanilla ice cream; it’s so simple and classic. That desert is beautiful! And perfect for July 4th Celebrations, even if it is a little more pink than red. My son always wants ice cream cakes at Dairy Queen and they are really expensive and almost always contain Chocolate, which he has an intolerance to. I had never thought about making my own ice cream cake until now! Thank You for another great idea Alli! Amanda recently posted…It all Started with a New Couch- and that’s when the TROUBLE started! This cake is absolutely gorgeous! Its great that I can print it out.. thats a great feature! Thanks for visiting my Fabulous Friday Party. I truly appreciate it. Thanks! I love a good party! This looks so good! I love a fresh and fruity dessert. Don’t tell anyone but some times I get tired of chocolate desserts. Summer calls for fruit and ice cream 🙂 Thanks for sharing on the Be. You. tiful link party. This looks amazing. It’s starting to get really hot here in Kansas so I plan to make everything I can cold.